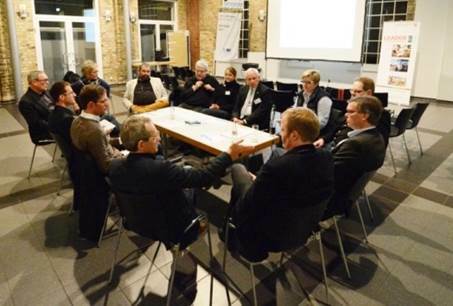 In Germany the municipalities play a central role in the process of climate protection and energy transition. Therefore in 2011 the BMUB carried out a nationwide competition called “Masterplan 100% Klimaschutz”. This program aimed to find municipalities that already are advanced in climate change processes and willing to increase their corresponding efforts. 19 towns and counties were chosen – the county of Steinfurt was one of them. The target of the “Masterplan 100% Klimaschutz” is to show ways to reduce the greenhouse gas-emission by 95% until 2050. Secondly the county of Steinfurt has to generate strategies how to reduce the regional power demand by 50 % and cover the remaining need by renewable energy (reference year 1990). From the beginning the Agency for Climate Protection and Sustainability (Amt für Klimaschutz und Nachhaltigkeit Kreis Steinfurt) in the county of Steinfurt cooperated in a large network with several local actors: climate protectors from the twenty four municipalities in the county of Steinfurt, regional citizens, politicians, regional power companies, companies in the “Unternehmernetzwerk energieland2050”, experts from the University of Applied Sciences, Münster, external experts of climate protection ,regional tourist promotion offices and further associations. The “Masterplan 100% Klimaschutz” is subtitled with the slogan “from project to principal”. The intention is to work and learn in starter-projects and generalize the experiences. The support of regional actors and active networking is extremely important. The application of a multiproject management system is intended to survey the hundreds of climate change projects referring to the county of Steinfurt. Additionally the support of local citizens, associations and companies concerning their targets for climate protection and sustainability is evident. The Masterplan Phase 1 analyzed the actual data and developed future scenarios. Here it was shown that wind power stations, solar or biomass power systems will produce sufficient renewable energy in 2050. The potential of power production will be higher than the predict power demand 2050. Therefore the “Masterplan 100% Klimaschutz” emblaze especially the technologies “power-to-gas” and “power-to-heat”. To reach a sustainable mobility different alternative gears like e-mobility, hybrid- or hydrogen-drive are involved in the development strategy. For further information please find a presentation of the Office for Climate Protection and Sustainability here for download.